On Saturday, February 20, at the Hilton Garden Inn (off of I-10) in Tallahassee, 12 Area Alumni and 21 Undergraduate Brothers attended the first Founder’s Day Luncheon of the North Florida Alumni Association (Charter Pending), and co-hosted with the Florida Alpha Chapter at Florida State University. 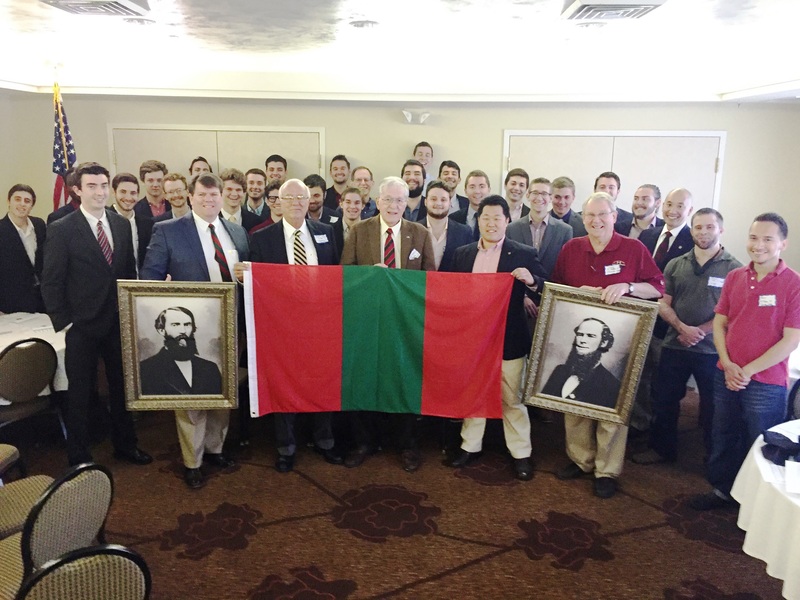 The atmosphere for our gathering was greatly enhanced by the Chapter bringing with them their portraits of Founders William Henry Letterman and Charles Page Thomas Moore, as well as their Flag of the Phi Kappa Psi Fraternity. Each place setting had a Program Agenda that also included a brief history of Founder’s Day events in Tallahassee since the Chartering of Florida Alpha in 1962, as well as a wallet size card of THE PHI KAPPA PSI FRATERNITY CREED by Brothers John Henry Frizzell (Massachusetts Alpha 1898) and Kent Christopher Owen (Indiana Beta 1958). It also included a listing of the Chapter Executive Committee, Florida Alpha House Corporation Officers and the Charter Class of the North Florida Alumni Association (NFAA). The Luncheon opened with an Invocation by the Chapter Hi, Pledge of Allegiance and a rousing rendition of NOBLE FRATERNITY. Brother Frank Taylor (Alabama Alpha 1964), NFAA Secretary, served as Toastmaster and proceeded to offer toasts to Founders Letterman and Moore, the Fraternity, the Chapter and the successful chartering of the NFAA. We then continued with our program by introducing the Chapter Officers, and the self-introduction of Alumni with highlights of what the Fraternity meant to them. Brother Taylor, who lives in Panama City, FL, was then recognized as the Alumnus who had driven the furthest to attend our Luncheon. The Chapter President then extended an open invitation to all to come by the Chapter House at 6:30 PM for the Chapter Founder’s Day Dinner/Social event. Following Remarks for the Good of the Fraternity, we circled up and sang AMICI. The primary goals of the North Florida Alumni Association are: to co-host the Annual Founder’s Day Luncheon with the Florida Alpha Chapter; to obtain Alumni Association status within the national fraternity; to support the Florida Alpha Chapter, the re-chartering of the Florida Beta Chapter at the University of Florida, and any new Colonies in area Colleges and Universities authorized by the Executive Council; and to reach out to all Phi Psi Alumni Brothers from all chapters nationally who happen to live in North Florida, from Jacksonville to Pensacola and south to Ocala, as well as those who live in south Alabama and south Georgia counties that border North Florida. Under New Business, five Alumni completed an application for membership in the NFAA bringing our Charter Class to 30 Alumni Brothers. The Annual Meeting was then concluded.